Imagine your perfect bathroom—is it sleek and modern, with a square-glass walk-in shower with steam control natural stone countertops and a two-flush toilet? Or is it a vintage, Art-Deco-inspired throwback with a claw foot bathtub, separate hot and cold knobs, and gold-trimmed everything? Whether you have conservative or progressive tastes in decoration (or, more likely, somewhere in between), there is one thing that all perfect bathrooms have in common—granite. Granite is made by compressing layers of dense minerals under enormous geological pressure for thousands of years. So it’s kind of like a diamond—it’s so incredibly hard that it can hardly even be scratched. 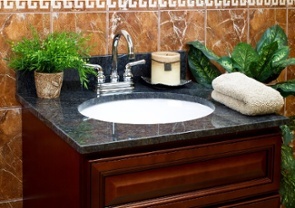 Granite is also resistant to water, stains, heat-damage, and more. Using granite for your bathroom countertops or anything else, will ensure that it stays in great condition for years to come. Because granite is a naturally occurring composite of elements from around the world, it’s color and pattern is dependent on the place it’s from. Granite comes in every hue and shade, from gleaming alabaster white to the deepest black, and everything in between. Some granite even comes with flecks of naturally occurring gemstones and precious metals, like amethyst or gold. From impressionistic swirls to lightning streaks and veins of complimentary colors, there is a granite variety for every occasion. Granite has been prized for its beauty since at least Ancient Egyptian times. They made pyramids and tombs out of granite to convey the highest level of prestige available to them. Today, from banks and office lobbies to the palaces of the highest officials in the world, granite is the stone of choice to inspire awe. 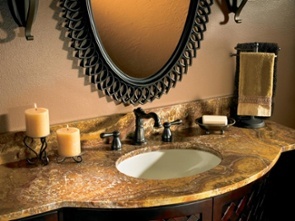 Having granite in your bathroom will truly transform your toilet into a throne. One of the biggest drawbacks people often mention about granite is the price. While it’s true that granite can be among the most expensive materials for stone countertops, its durability means it won’t need to be repaired or replaced, and its timeless beauty means it will never go out of style. Barring a total collapse of the housing market in the next fifty years, having granite countertops in your bathroom will only increase the value of your home.